Moving a horse to a new location can be stressful for everyone involved. Whether you are moving your horse across town or across the country, you must plan ahead to make the transition smooth for everyone and minimize problems that might occur. 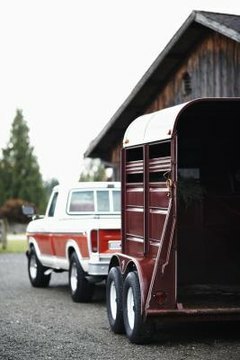 The more care you take in planning the move and preparing your horse, the more smoothly he will adapt to the new location. Before you move your horse, you must take into consideration how drastic of a move you are making. If you are only moving across town, chances are your horse's feed, water and the weather will not be drastically different. If you are moving across the country, then you have a lot more to prepare for before you move. Make a list of things that will be different for your horse at the new facility. Take into consideration the amount of turnout, the temperatures and the types of feed and hay. Make things easier on your horse by bringing plenty of the feed and hay he is used to with you when you move. You also may want to bring along several gallons of the water he is used to, as the water in a strange place may take some getting used to and you don't want him becoming dehydrated. If you know the weather is going to be a lot colder where you are going, buy a well fitting horse blanket and have it ready to use when you reach your destination. Moving a horse to a new facility is stressful enough without throwing him immediately out into the middle of a pasture with 20 strange new pasture mates. Give your horse a day or two to settle into his new environment. Allow him to explore at his own pace. Make sure he is eating and drinking properly. Turn him out by himself or in a small group for a day or two somewhere where he can become acclimated gradually with the terrain, fences and new horses. Don't add stress by asking him to work hard or overwhelming him. Some horses are calm regardless of the situation, while others may become very stressed and go off their feed when they are moved to a new barn or separated from their familiar pasture mates. Take your horse's personality into consideration when you are moving him. If you know he is submissive in the herd hierarchy, make sure he is put into a pasture with less aggressive horses. If you know he will run other horses off their feed, make sure he's fed by himself or with other similarly dominant animals. Why Do Horses Splash Water?